Why has the journalistic community chosen to downplay the latest 9/11 Commission Report? It's the media who need to raise the heat on this matter, Why haven't they? It seems as if most of the journalists today are either scared cowards, frauds, or paid for by the administration, which is to say corporate conglomerate ownership. It's confusing and downright frightening. This is just one example. There are so many. What has gone awry with the media? I'm perplexed, confused, and worried. welp, its been a few days since my last post.. so i figured i would make a quick post on a few things of interest..
first off, a law suit revolving around two briefings which were classified after they were already public record has been settled.. the arguement was that the feds improperly claimed national security to re-classify the information, when in actuality they were just trying to coverup things that made them look bad..
the guys over at reopen911.org sent out an email letting me know they are about to wrap up their free dvd offer.. this guy Jimmy Walter has invested close to 3 million trying to spread the word about the lies and coverup surrounding 9/11.. he is giving away free dvd's, so go order yourself a copy before they go off to manufacturing..
here is an article in the LA Times about the newly released FAA warnings.. I love how the media is constantly berating the FAA for not following up on the warnings when the warnings obviously would have come from some other intelligence agency, not the FAA. Increasing numbers now believe that based on mounting credible evidence it goes beyond the criminal negligence suggested here by Robert Scheer. Evidence from whistleblowers and others ignored by the Commission now demands that Americans and the world at least seriously consider the possibility of willful criminal complicity by individuals with vested interests within the U.S. government or by U.S. government contractors who stood to gain immensely (and did) from the attack. Instead of these individuals being investigated or held responsible they have been let off the hook or in many cases given promotions and rewards for their 'incompetence' or 'criminal negligence'. 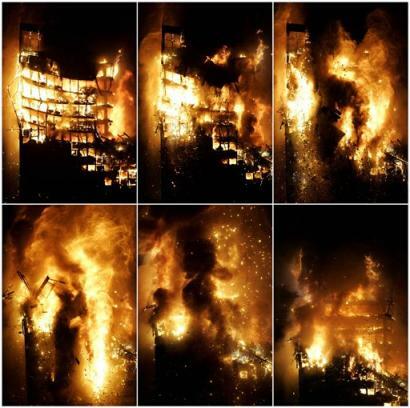 there is a 32 story skyscraper in madrid on fire. 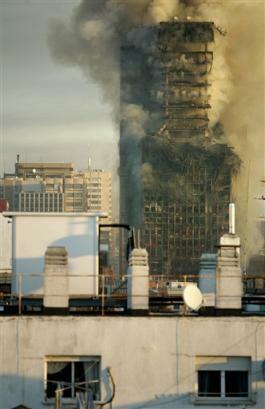 a few of the top floors collapsed onto the lower floors, but the building is still standing. this building appears to have no 'core'.. hopefully this building will stand and no further destruction will occur. luckily noone was in the building. it was about 5-6 months ago that i was looking at a magazine rack when i noticed the latest copy of popular mechanic.. it caught my eye because the cover had a massive nuke going off and seemed like an awefully scary cover.. while i dont remember the title on the cover, i do remember thinking it had to have been made with the idea of scaring the bejeezus out of its readers.. i flipped through the magazine and could find nothing about the article which dominated the cover.. i thought it was odd and put it back on the rack..
popular mechanics is about to release an article claiming to debunk all of the 9/11 conspiracies.. while i would love for new information or research to prove the 'conspiracy theories' wrong, i highly doubt this article will be more than fluff and diversion.. in any event, the great guys at wtc7.net have gone ahead and responded to this article.. im hoping the PHDs at physics911.net will take some time to comment on this article too..
karl schwarz has done it again with part 5 of 'Pop goes the Bush Mythology Bubble'.. his new article is focused on what he has found in researching the large plane parts found at the pentagon.. these parts have never fit in properly with the designs of a 757, but until now most of this was speculation based on 757 schematics.. with his new article he has shown the planes these parts were used in, and i applaud him on his efforts, as he has succeeded in places others have failed. Jimmy Walter was the guy who ran the commercials in NY showing the questions which remain surrounding WTC7 and the pentagon.. he spent around $2 million dollars to run his advertisements.. most of those outside of NY didnt see these ads, although they did make a blip on the show Countdown with Keith Oberman..